Submitted by camerabob on Fri, 10/28/2011 - 5:03pm. POI Info: These locations include some hospitals in neighboring New Jersey and Long Island counties as well. 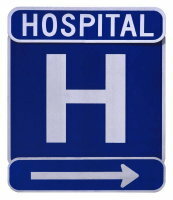 I added hospitals that were closed since 2009 since they may appear on maps still. They are noted "**CLOSED**" in the POI name as well as the closure date in the comment field.